OVLL 11-12 All Stars eliminated by Section 7 Sweetwater Valley; 7-4 (7 inn). Congratulations team for being a Southern California Sub-Division Finalist and a fantastic OVLL All Stars career. Thank you team for the lasting memories you have provided!!! OVLL 9-10 All Stars eliminated by Section 7 Sweetwater Valley; 21-11. Congratulations team on a terrific run, Southern California Sub-Division Semi-Finalist. We are very proud of you!!! Great week for OVLL!!! This week OVLL collected three Section 10 Titles. 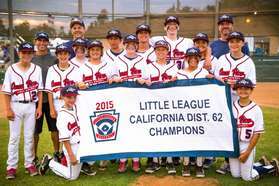 It began with the 9-10 All Stars capturing the first on Monday with a 9-0 victory over D68 (Trabuco Canyon LL). Then on Wednesday, the 11-12 All Stars defeated D55 (Aliso Viejo LL) by a score of 10-0 in Ladera Ranch to collect the second. Moments later on Wednesday, on OVLL home soil, the 8-9 Super Stars closed out their season with a 11-8 victory over D55 (Aliso Viejo LL) to collect the third. The 9-10 All Stars will now move on to the 9-10 Sub-Division Tournament at El Cerrito Sports Park in Corona. The 11-12 All Stars next tournament, the Little League Sub-Division Tournament, will again take place at Cox Sports Park in Ladera Ranch. Keep up the fantastic baseball OV!!! !! !OVLL in Sub-Division Tournament Finals Wed. (7/29) @ 5PM !!! Calling ALL OV fans...our 11-12 All Stars team is in the Southern California Sub-Division Tournament Finals tonight (Wed. 7/29). The winner of this tournament will advance to the State Title game. Please come out and support them if you can. The team will be playing Sweetwater Valley LL at Cox Sports Park (Ladera Ranch LL) @ 5PM. If you cannot make it out to the field, the 11-12 game will be streamed LIVE on the web by CASportsZone. Courtesy of our sponsor 714 Tickets. OVLL 11-12 All Stars eliminated D55(Aliso Viejo LL); 10-0 capturing Section 10 Championship Banner and advance to Sub-Division Tournament!!! 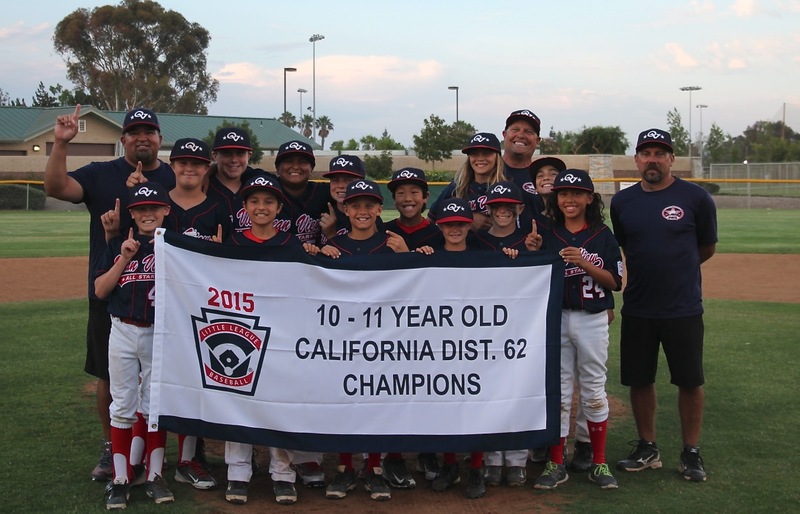 OVLL 8-9 Super Stars eliminated D55(Aliso Viejo LL); 11-8 capturing Section 10 Championship Banner to complete their run!!! 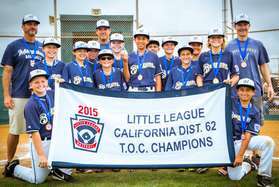 OVLL 9-10 All Stars eliminated D68(Trabuco Canyon LL); 9-0 capturing Section 10 Championship Banner and advance to Sub-Division Tournament!!! Ocean View Little League is off to a great start in this year’s Little League Baseball All Star tournament as our 9 Superstars, 10, 11 and 12 All Stars each won their respective championships to, once again, capture the titles for District 62. Our teams are playing such great baseball and giving an impressive show of sportsmanship and class! Check the TOC & All Stars page for results and schedules. OVLL will be hosting the 8/9 Super Star Section 10 games! We need volunteers to make it a great experience for everyone! We need OVLL Scorekeepers, Pitch Counters, Snack bar supervisors/workers, and Field Maintenance for the games - please sign up! Please click the link below to help as much as you can... only one game per day! OVLL 8/9 Super Stars defeat Huntington Valley LL to capture the D62 Championship! OVLL 11/12 All Stars defeated Huntington Valley LL to capture the D62 Championship! OVLL 10/11 All Stars defeated Huntington Valley LL to capture the D62 Championship! OVLL 9/10 All Stars defeated Seaview LL to capture the D62 Championship! ...put the barrel on the ball and anything is possible. 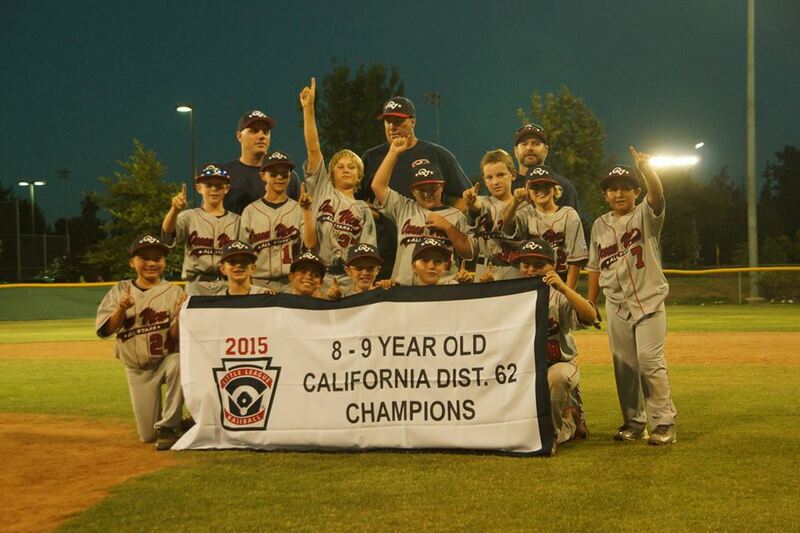 Majors Championship: OVLL Brewers defeated Fountain Valley1; 3-2 Brewers win Championship! Minor A Championship: OVLL Stars lost to Huntington Valley2; 3-2 Stars finish in second place. Minor B Championship: OVLL Mets lost to Huntington Valley1; 20-15 Mets Finish in second place. The OVLL All Star teams for 2015 have been named. Congratulations to all our players and coaches. We wish you the best of luck in this year's tournament. GO OVLL!!! 11/12 All Star Team (Little League) - Manager Scott Pantel; Coaches Ken Marden/Lance D'Amico. Micah Blake, Ryan Carles, Jake D'Amico, Cole Kaplan, Tristan Kennedy, Nick Madole, Kai Marden, Luca Pantel, Nate Skorheim, Shane Stafford, AJ Valle, Parker Walpole, Owen Wessel, Matthew Wilson. 10/11 All Star Team - Manager Dana Lux; Coaches Andy Hurtado/Toby Reece. Ethan Choi, Jack Clark, Samuel Cohn, Cade Hart, AJ Hurtado, Evan Knipe, Jimmy Legg, Chad Lux, Kai Mullens, Riley Reece, Jack Smith, Antonio Ventimiglia, Zac Vuncanon. 9/10 All Star Team - Manager Tony Cianca; Coaches Chris Aparicio/Mike Flory. Sebastian Aparicio, Andrew Bentley, Roman Cianca, Rizal Collado, Kyle Donoho, Jaylene Duarte, Jason Flory, Matt Fox, Cole Kenrich, Bradley Navarro, Kyle Palmer, Matt Thien, Colby Turner. 8/9 Super Star Team - Manager Craig Lane; Coaches Michael Gates/Sean Lewis. Connor Adams, Jett Burden, Gavin Clarke, Gavin Croghan, Owen Eisen, John Gates, Ben Hagadorn, Carson Lane, Evyn Lewis, Dylan Mayorga, James McGhee, Aaron Minnicucci, Conner Wood. CONGRATS TO THE 2015 TOC QUALIFIERS!! We are excited to have these teams represent OVLL, and we know they will all make us proud! Please come out and support our teams in the TOC event being played at Seaview LL & Huntington Valley LL!!! Ocean View Little League will soon be selecting our 2015 All Star teams, and will proudly announce our All Star team rosters on Saturday, June 6th (per Little League rules, this date is non-negotiable). If your child has been selected for one of the All Star teams, you will receive a phone call on June 6th. A parent/player meeting/ice cream social will be held Sunday, June 7th at 3PM at the OVLL fields (common area by snack bar). Please make sure an adult (preferably a parent) attends with the player, as we will be covering critical requirements for the All Star Tournament. All players will be required to submit an ORIGINAL CERTIFIED BIRTH CERTIFICATE (no abstracts, baptismal certificates, etc) as well as THREE (3) ORIGINAL PROOFS OF RESIDENCY from THREE (3) different categories (ex: auto registration; bank statement; electric bill). Photocopies or printed Internet billings will NOT be accepted (California Driver’s License is the ONLY item that may be photocopied). If you have any concerns/questions about a document you are submitting, please supply a fourth document for consideration. For families with more than one child on an All Star team, we only need to get ONE set of the THREE supporting documents. *Important for this year: Due to continued recent falsifications with Residency Documents around the country, Little League Baseball will not accept statements dated after February 1, 2015. If you wish to submit a utility bill, bank statement, credit card statement, etc., be sure the date on the statement is between February 1, 2014 and February 1, 2015. Many documents issued yearly (i.e. property tax, car registration card, etc) will be ok as long as they weren’t issued after February 1, 2015. Any yearly issued document must include the February 1, 2015 date – this date is important to Little League as it covers the time the player was registered and playing. The only item that can be over 1 year old is a copy of CDL and it must be current (not expired). Should you choose to submit a copy of your CDL, make sure the copy you are submitting shows clearly the date of issue as well as expiration. Or, if the link does not work, visit www.littleleague.org, click on “forms and publications” then open the document titled “Proof of Residency Requirements”. *If your child is playing for OVLL under a waiver, the league’s copy of the waiver will be used instead of the above mentioned residency documents!! All documents for All Star players will be due by Sunday, JUNE 7th! We ask and encourage ALL parents to have their documents ready to bring to the parent/player meeting on June 7th to expedite this process. ALL documents will be held by OVLL until tournament play is over – again, no exceptions. If you have any questions, please contact Rachel Blake at player.agent@ovllbaseball.com .